The Pink Creampuff's First Adventure On A Home Console! 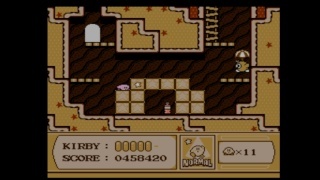 Kirby's Adventure was one of the first platforming games that was easy enough for anyone to complete. Despite the absolutely cute nature of this game it's fun and addictive that will keep you coming back time and time again. This game has seven large unique worlds with many levels each. There are a few minigames as well such as quick draw and egg catcher, which are quite fun. The game also features a catchy soundtrack and memorible tunes. But the real meat in this game is it's gameplay. 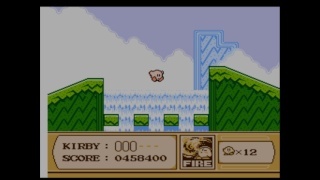 The gameplay is unique in the sense that Kirby eats his enemies to gain new powers instead of obtaining power-ups. Not only that, but if Kirby eats any two enemies at once, it will activate a random power instead of that of the ememy swallowed. 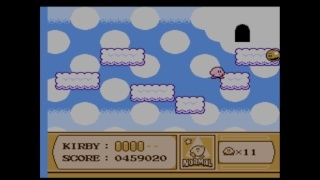 Kirby's natural ability to float in the air is another unique element that you'll be glad the cute little cream puff has as some areas are quite difficult to reach without utilizing this ability. Also hidden in some levels are switches that unlock minigames and other stuff hidden on the world map. Bottom line: Kirby's Adventure is fun and although it looks "kiddy" it's really fun for people of all ages and it's a great deal at 500 Wii Points . A blast to the past with Kirby games! ↑Anticipates Kirby's Return to Dreamland, thinks it'll be better then DKCR and NSMB combined. It's huge for an NES game it has over 40 levels 4 minigames and secret levels! Roboluigi wrote: It's huge for an NES game it has over 40 levels 4 minigames and secret levels! Do the other entries contain as much production value? Nope Epic Yarn was the first game since Kirby's Adventure to feature so much content without turning it into a minigame collection "looking at you Kirby's Super Star". Indeed,but Kirby Return to Dreamland will likely be every bit as good! If you guys had 500 points left and a friend just gifted you Moto Heroz, would you? B.) Download 3D Pixel Racing. C.) Wait and see what the DLC for Moto Heroz is like. 3D Pixel Racing is nearly unplayable due to shoddy Wii wheel only controls....and the download content for MotoHeroz is supposed to be extra stuff for party mode which makes it not so good if you mainly play single player. Thanks, that's good to know ZezHylia. I didn't know the DLC was only going to add more for party mode. I thought it might add to the online and story mode as well. Then I guess I'll download Kirby then. WiiAboutU wrote: Thanks, that's good to know ZezHylia. I didn't know the DLC was only going to add more for party mode. I thought it might be for the online as well. Then I guess I'll download Kirby then. I just updated this review with screenshots and a few other changes! The new style of reviews is much more tidy now thanks to the fact that every pic in the articles are the same size. I love Kirby and this game is the best! Ichigofan wrote: The Pink Creampuff's First Adventure! But Kirby's Dream Land was his first adventure! In any case, superb review, my friend! @GeekyGamerZack Thanks for the clarification.